Author Bridget E. Baker won her first writing contest in first grade with a story about a day in the life of a little spot of air. (Who says you need a good hook?) She hasn’t stopped writing (or talking) since then, although she was briefly derailed by her pursuit of a legal career. Ultimately, boring words, well, bored her. She quit her job to spend less time counting gobs of ill gotten gains, and more time writing stories. She hasn’t wasted a second on counting money made from writing fiction, which has left her plenty of time for crafting stories. This is Part 2 of 2. Read Part 1 here. Q. Can you tell me what (Facebook advertising) results you have been seeing so far? A.In January, I had my profit right, but my spend was WAY higher. Here. I’ll show you screen shots. OK so you can see in January, I made $2862, but I SPENT $2359 in ads. Essentially I only had a 21% ROI. 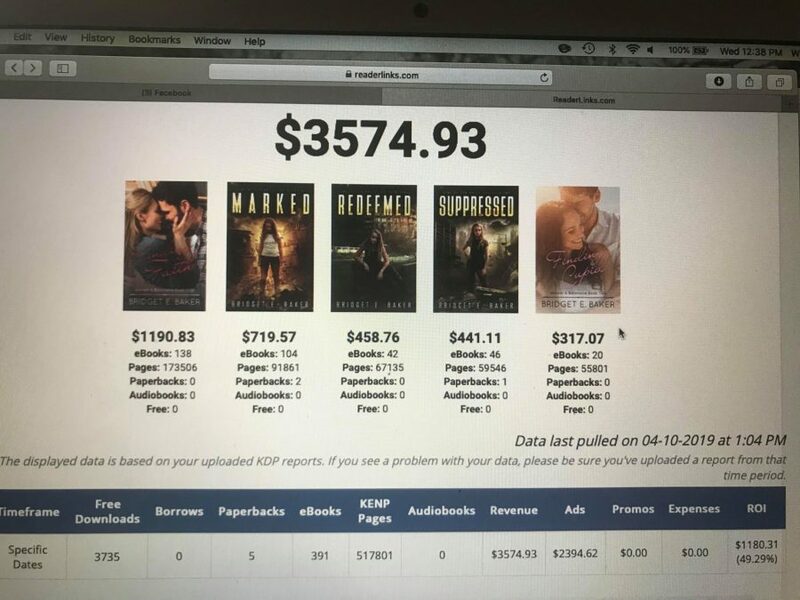 I actually did way better on Marked, but I lost money on my christmas romance (sales died about halfway through january, and it was a standalone book.) 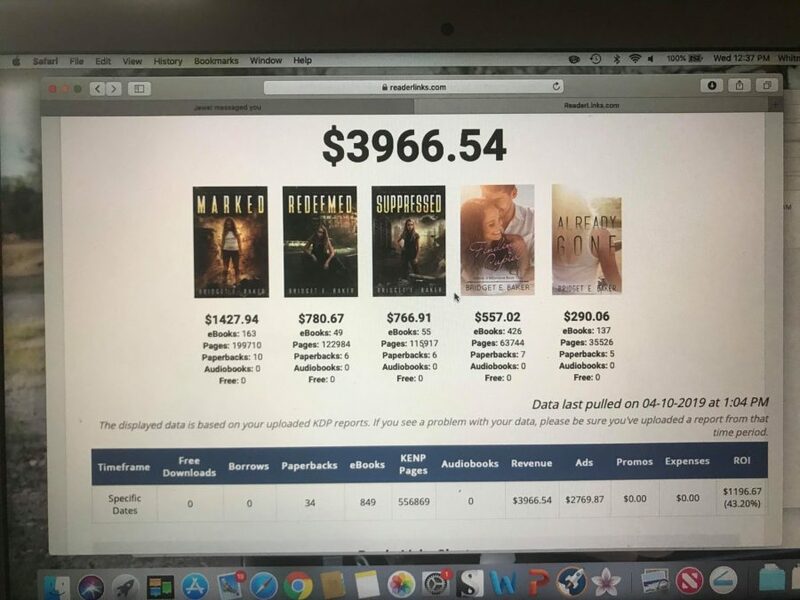 and my YA suspense only ever broke even, and that was once I got the ad creative set up well. (Good images, good text.) At the beginning I was throwing spaghetti against the wall. Then in February, I ran a little bit longer on my YA suspense (because I had trouble giving up. It’s a really good book! haha). Q. For some reason, I thought page reads would be huge money earners. More than what your numbers show. A. 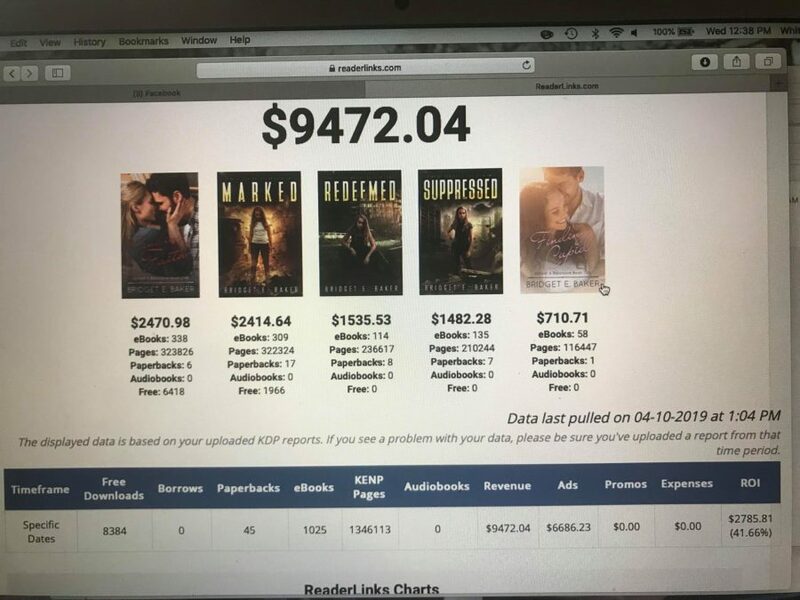 Page read value is always low in January too because lots of people get Kindles at Christmas and have free KU trials so the total reads go up but revenue doesn’t. But this might help, too. Check out my ad spend when I started. (It’s the line way over my revenue!) I was blowing way past my income as I raised rank and found effective headlines and blurbs and images. It’s a steep learning curve. Q. So as you spent less but wised up, your revenue increased? What was your spend / revenue in February? A. Right. I’ll show. But even in February, I had an ROI of 40%. I spent $2770 and made $3967. So it was improving. In March, my goal was to scale, which means up my spend on performing ads. I also released a new book and rebranded my first in series. So I made more. But I spent way more. Get ready. I spent $6686. But I made $9472. I had the same ROI essentially. 41%. There are a handful of reasons but the biggest was, I was now pushing my romance. I had cut ads on it back in Jan and didn’t restart until March. I had also tried advertising my second in series to bad results. The conversion was lousy. I now only market first in series. Q. Those are big numbers. So roughly $225 a day in ads. A. So here’s April so far. Spent $2400 but made $3600. With 2/3 of the month still to go…ROI is up at 50% almost. I’m hoping to keep it there. Here’s my chart. Q. So in order to scale up, you are spending $250 a day. How do you keep nerves of steel? A. Well, I set my monthly max. And I make sure I’m on target. 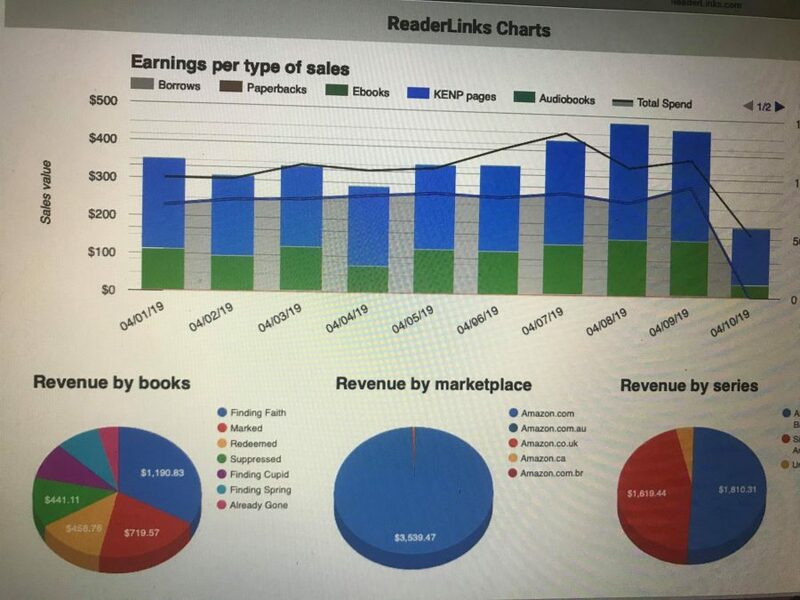 Then I watch my Readerlinks page a few times a day to make sure I’m making more than I spend. My max is $7500. I won’t go over that. But I can see each day if I’m exceeding my spent at any point that’s why I love FB. It spends your money reliably and gives you real time data. Q. Well so far, you have made back more than you have spent. That is amazing. A. But honestly. I’m playing for the future. I was okay with breaking even… because my YA series I love is coming out this fall. Four full length (100k word) novels with three interconnecting novellas. It’s outlined and the first is written. It’s the book that so many publishers loved. I’m putting it out… so I see my reader base now as being groundwork for that release. The more people who read Marked and think it’s OKAY, the more people whose socks I’ll knock off when my beloved book baby series comes out. And I have another two YA series where the first is written and the rest are outlined–I plan to do a new YA series each fall. And my romances in the spring. So each year I’ll rapid release a new YA series, hopefully growing my audience each time. Which means…if I make anything right now, that’s great. Because I won’t need to sell those readers later. They’re following me on Amazon, and on Facebook, and on my newsletter, and when I release my next one, they’re ready. So I see that money as an investment month to month, yes, but more as an investment in my career. Q. Bridget, I really appreciate your sharing those numbers. 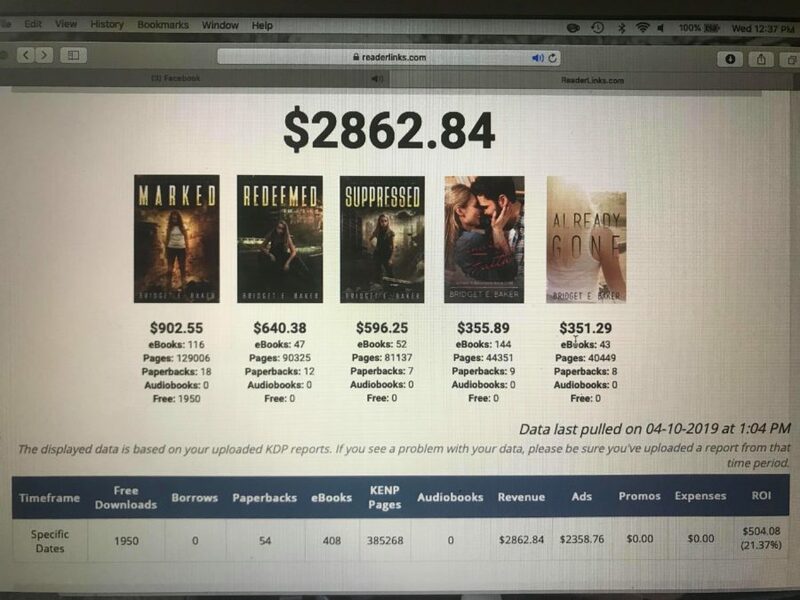 How many ads do you have running on a book, on the average? A. I have three main sets. Two for my romance, and one for Marked. (Two for romance because one focuses on the couple images, and one is on the dad and daughter image.) I like to diversify; I experiment with images and creative text. Once I find a winner on text, I experiment with audiences.Then I have 5 audiences for the two romance sets running at once. I find that some do great one day, and others do great the next. I will have like $10 on one ad, $20 on another. I sort of shift the amount I spend around 8 am, depending on how it’s running that day. I have about 8 ads running on Marked, very similar, but a little different. They all hit different audiences. I like to spread it around. Q. You recently publicly did a NaNoWriWee (writing a novel in a week), and I saw your outline. Multiple pages. How do you outline a book? And how are you so prolific with your words? Mind you, you are writing longer books, right? In the 80k word range? A. I average about 2,000 words an hour. I always have. Yes, my goal was to complete the book in a week. It ended up being 88,000 words in all, and it ended up taking 9 days. Darn it. Hahaha. But I’ve done 80k words in 6 days quite a few times. I do write extremely long and complex outlines beforehand. I kind of think about the book, and let it simmer while I’m working on the current book, either drafting or editing. I jot down ideas. Once I’m done with the current book, I spend between 4-40 hours doing my outline. I map out the character arc for all main characters first, drafting the plot of their backstory. Then I figure out what that means from a story perspective and how they’ll interact. Q. That is a fabulous process. Now just two quick questions, and then I will let you go. You recently went to the UK. Loved the pics. Do you have family there? A. Nope. Not a soul. I wrote a paranormal romance that ends with the Grand National. When I wrote it, I told hubby I wanted to go. We decided to make it my girls trip for the year. (We do one couples trip, a few family trips, and I get one girls trip each year!) I know, I’m spoiled. The good news is, it’s research! And I took some images I can use for promotional photos when I release that book sometime next spring. Q. National Velvet!!! Speaking of girls…how do you manage to dress all your girls in the same dresses on Sunday? A. I have a tiny obsession with dressing my kids up. I fell into the boutique clothing world a few years ago, to my husband’s great horror, and buy a LOT of dresses. Way too many. But there’s great resale in them, so I’ve made back nearly what I’ve spent. As far as hobbies go, I figure there are worse things I could be doing. Hahaha! My oldest is almost too big for them, though. It’s making me super sad to contemplate. Most only go up to size 12 and she’s IN IT. GAH! Q. LOL #momproblems. Well, you have a beautiful family. I always look forward to your Sunday photos on FB. Bridget, thanks so much for your time. This has been so fun!! And congratulations on your much-deserved success! 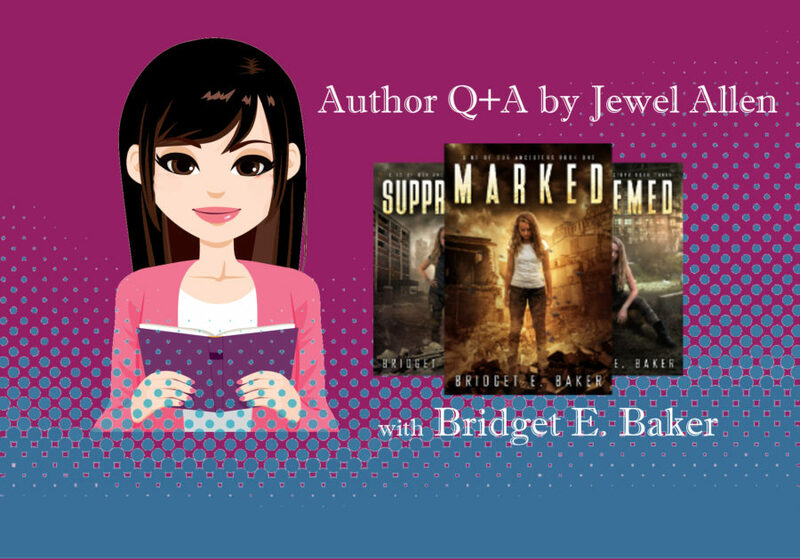 Check out Bridget E. Baker’s Amazon page or her website. 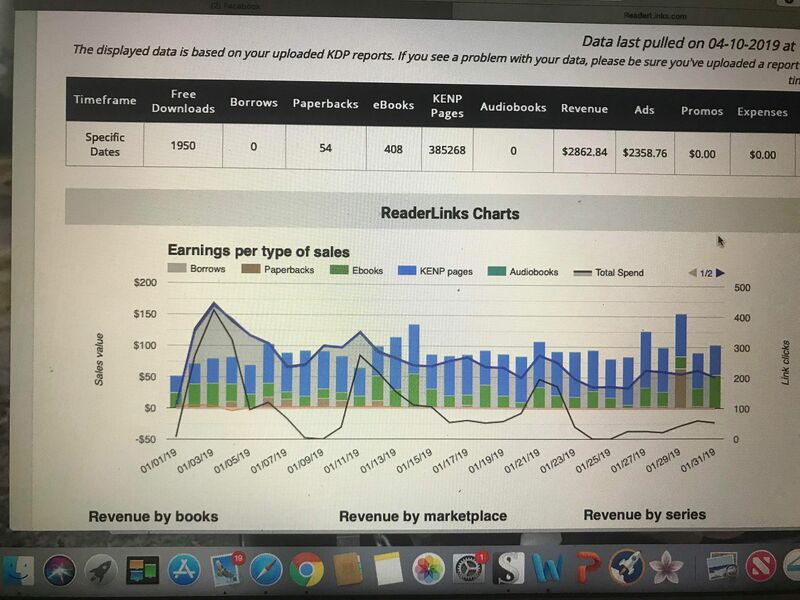 To learn more about how to write and publish fast for profit, check out my book Rapid Release. Subscribe to my newsletter here.